It is composed by high-strength low-alloy steel plate. Lower boom amplitude range of 0~70°, smaller boom amplitude range of 0~90°. Upper boom used four-linking hinge boom luffing mechanism to reduce impact of movement. It has compact structure, well—balance, good mobility and big operation range function. Power is taken from PTO box installed in gear box, and then transfer to main oil pump. 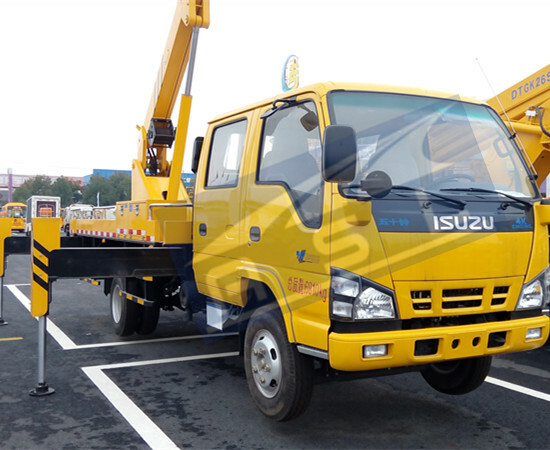 When gear box is in empty gear, pull PTO box handle which is placed at left side of driver’s seat in the cab, PTO box can be connected with or separated from sliding gear which is joggled with gear box of vehicle. The output axle of PTO box will drive oil pump to work, high pressure oil discharged by oip pump will be supplied to each parts. Slewing gear is composed of revolving dial, hydraulic motor, redactor, Open type external tooting drive pinion and four points touching circulating swivel bearing. The arm support saddles are installed on the revolving dial which is installed on inner circle of swivel bearing. Inner circle of swivel bearing is connected with sub-frame of vehicle beam. Redactor drive pinion is driven by hydraulic motor to roll on gear ring swivel bearing which makes revolving dial bring upper body of vehicle slew. Bucket should keep its bottom horizontal with arm’s movement during work. Equalizer assembly of vehicle bucket constitute of two group of au pair quadrangle type link system at both side, which is also equipped with adjustable nuts. Vittae is of meshing open drive type. 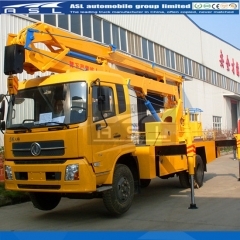 The vehicle has two kinds of hydraulic operation system to meet use’s need. Hydraulic oil is transferred to two-position three-way conversion valve in leg valve group by gear pump, and then reaches each leg cylinder through leg conversion valve group. After vehicle is at a horizontal level, two-position three-way conversion valve converse, leg valve stops working, hydraulic oil reaches arms’ cylinders and revolving motor so that the movement of arms can be finished. Hydraulic oil is transferred to two-position three-way conversion valve in leg valve group by gear pump, and then reaches each leg cylinder through leg conversion valve group. After vehicle is at a horizontal level, two-position three-way conversion valve converse, leg valve stops working, hydraulic oil reached multichannel conversion valve with two-position and three-way on turntable bearing. When two-position three-way valve is pointed downward, revolving movement of arms and rotating floor can be operated on revolving dial. 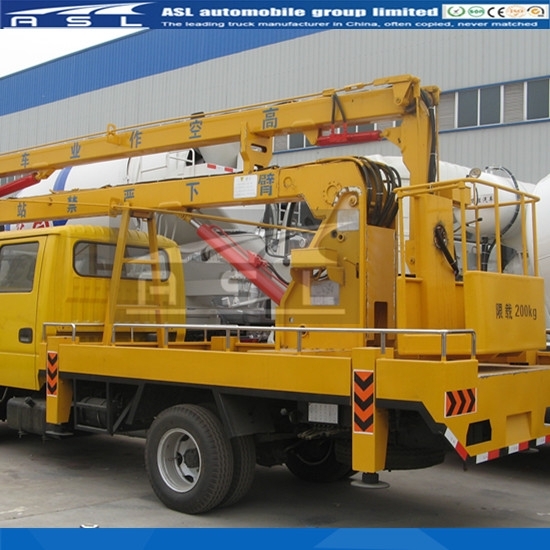 When two-position three-way valve on 14meters Truck Mounted Telescopic Work Platform is pointed upward, operation on rotating floor is shut off, hydraulic oil flows to multi-way valve group on bucket, so the operator can control revolving movement of arms and rotating floor in bucket. C: Because adjustable return orifice check valve and two way hydraulic lock are installed in lifting arm cylinder vittae, so the rising or falling speed of arms can be controlled. The arms can be stopped at any angle and any position. Accident of express falling cause by fracture of hose can be avoided. D: Leg cylinder is also equipped with two –way hydraulic lock so that leg can not releases itself in case of accident. Because operation method has two types, so the operations area also has two types. A: In under operation vittae system, operation area is equipped with multi-way conversion valve group; all the handles are in operation area so that all the movement can be operated. Manometer is also installed to monitor the changes of work weight and system pressure. Operation area is placed at left surface of vehicle dial. B: In upper and under operation vittae, operation area includes three parts; multi-way valve group controlling the movement of leg is placed at left surface of vehicle dial; a group of multi-way control valve controlling the movement of arms and revolving is also placed on bearing of revolving dial and bucket. A: Strictly follow user’s manual to make preparation work before drive. When start to run a new truck, good running surface should be chosen within 1000km. speed should not be faster than traffic rules. B: Lubricate each part of vehicle according to lubrication requirement. A: After reaching work pot, choose proper position to park. After park, skid the wheel for the descent, place gear box at empty gear, engage the gear of PTO box to keep make oil pump racing for 10 minutes to rise the tem pressure of hydraulic oil. B: Landing leg: Control the handle of landing-leg' reversing-valve which can make the landing-leg stands steady. Generally speaking, the lifting height of landing-leg is no higher than 30-40mm. 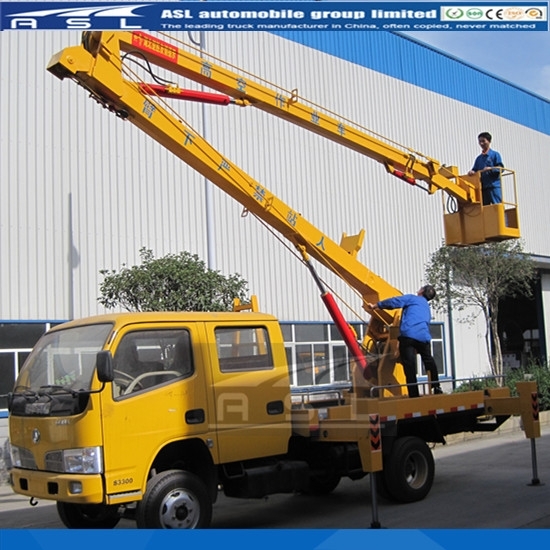 C: Lifting arm: Control both of these upper arm and lower arm' lifting handle and get-on revolution handle which can set the working platform on the needed working station. D: finish of work: Take the upper arm and lower arm to their original station through descending them alternately. Take back of the landing-leg. Put the gear of PTO aside which can stop the oil-pump working. Release of the brake. All above have been down, then the truck can drive in other gears and start to the next step of work on other working station. (1) The landing-leg must stand steady on the ground when working. If not, the work high above the ground that is prohibited. The operator must tighten the safe belt when he operates in the basket. (2) The upper arm and lower arm should be moved alternately when lifting the work platform. During the lifting work, the separation angle between upper arm and horizontal line is no over than 80 degree upwards and no less than 40 degree downwards or else it would cause the equilibrator goes wrong. (3) When operating this reversing-valve handle, the operator shall move this handle in modest speed instead of pulling or pushing it suddenly in case of damaging the working oil-circuit and forming heavy hydraulic shock and mechanical vibration. (4) It is prohibited of adjusting landing-leg when working. If adjusting needed, the upper arm and lower arm must been taken back before adjusting. (5) The gradient of work site is no bigger than 3degree. (6) When the truck works, the rotating speed of engine must be kept little quicker than idle speed. Moreover, keeping the engine does not stall on. But it is also prohibited that the operator presses the accelerator heavily. The rotating speed of engine is no over than 1500/min. (7) when driving, there are two things cannot be down. One is driving the oil-pump, another is loading person in working bucket. (8) The truck cannot work when the weed speed is over the fifth degree. 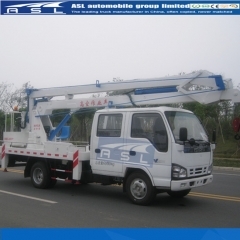 (9) This truck just can be used in this kind of work high above the ground such as street -light, gardens, and construction etc. This truck cannot use in high pressure electrification if it did not be refitted with special equipment yet. (10) The operator cannot leave the platform arbitrary while this truck is working. 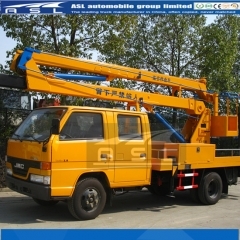 (11) Anyone who stands under the working arm and working bucket is not allowed when this truck is working. 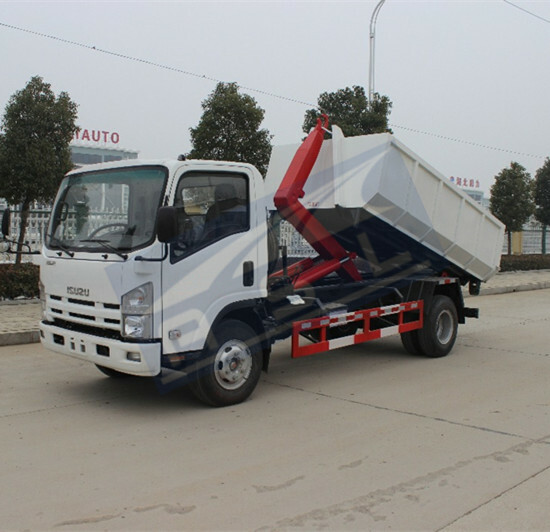 (12) This truck can work in the even range of 360 degree, and the best range is the 240 degree of rear part. (1) The oil tank should be cleaned and in which the oil should be changed after the new truck have been used about 200 hours. In general working situation, the above way should be down semiannually. If this truck be used in dirty work site, the cycle of changing oil should be shortening. (2) The hydraulic liquid must be kept clean. In the winter, the antiwear hydraulic liquid type YB-N46 should be used when the degree is lower than 10℃, while in the summer, the antiwear hydraulic liquid type YB-N48 should be used when the degree is between15℃-30℃, moreover, if the temperature is higher than 30℃, the antiwear hydraulic liquid type YB-N100 should be chosen. (3) If there have any situation such as jump, spring,and noise,etc.Happens,there must have air in the hydraulic system. In order to release air, the operator can operate any part to move repeatly.If necessary, the operator also can screw off the oil pipe' joint to release air. 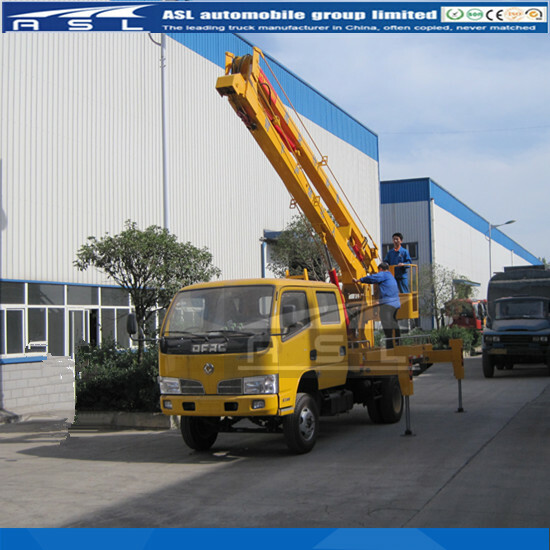 (7) When adjusting or changing the balance stick, set the swing arm of stick equipment on the right installation site. After that, the working bucket would stay in even situation. (8) The hydraulic elements shall be kept clean and reduced to dismounting to the greatest extend in case of damaging elements or mixing dirty. 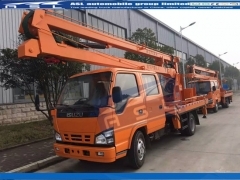 When Dongfeng 16meters Hydraulic Articulated Working Platform dismounting is necessary, it must be known of its construction. (9) Lubrication: The way of lubrication is according to vehicle' and refitting’ instruction. The way of lubrication on reducer and revolution landing is according to instruction. View picture five. (10) Keeping: This truck shall be kept in garage. While being set outside, it should be covered with waterproof cloth. If this truck will not be used for at least half a year, it shall be kept in seal up for keeping. At the same time, this landing-leg can be set steady on the ground. Check this truck monthly and blow up tire and clean dirty, moreover, and run this truck idle monthly. 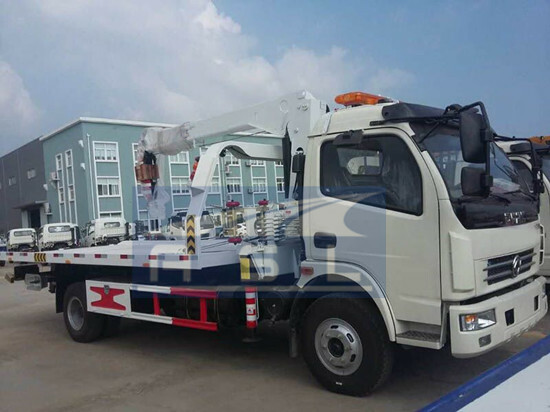 A: During rail transportation, this truck can be set on the flat-bed. 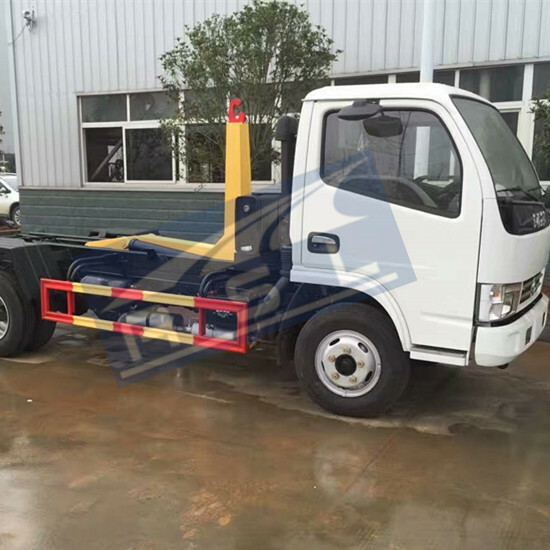 This truck can drive onto the flat-bed truck along the slope 15-25degree. B: Drain all of water in radiator and all of oil in oil tank . The electrolyte shall be dropped when the winter comes. D: This truck must be checked seriously after being in the destination. E: This truck shall be checked and maintained biennially. 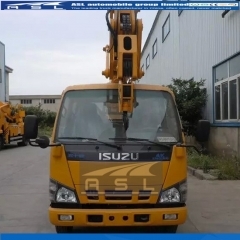 The content of inspection including running idle, rated capacity and running with loading,etc. 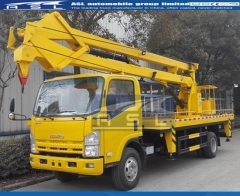 F: Supplementary specification: The lifting equipment of this overhead 14meters Height Truck Mounted Boom Lift which can lift one tonnage load is operated easily.